I'm still knitting like crazy trying to finish up gifts for the Holidays, so my reading has been limited, but I'm still keeping up with my book group reads. 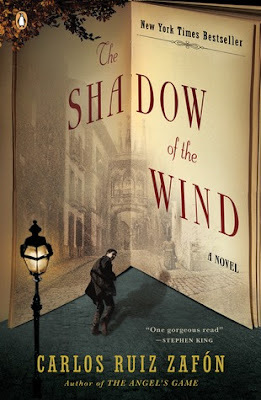 This month, we read "The Shadow of the Wind" by Carlos Ruiz Zafón. "Shadow" is the first book in the "Cemetery of Forgotten Books" series, of which there are four. Well, technically, there are three books and a short story right now. From what I understand, the fourth book is due to be published in 2018. ANYWAY, "Shadow" is about a young boy named Daniel Sempere who is being raised by his father (his mother recently died), a bookstore owner. When Daniel is around 10 (? I think), his father takes him to a secret library of rare and, for all intents and purposes, forgotten books (hence, the name of the series). This library is huge with thousands of books. Daniel is told to wander around and select a book - a rite of passage in the Sempere family. The book he selects? "The Shadow of the Wind" by Julian Carax. Daniel loves the book, and basically becomes obsessed with finding out more about Carax and his other works (I can totally relate with this feeling). And this is where the story gets interesting - someone has mysteriously destroyed every copy of Carax's books, except for what was stored in the "Cemetery." Daniel's fixation on discovering what happened to Carax and who has been burning his books, and why, takes Daniel on a multi-year quest filled with unusual characters, intrigue and murder. All of this SHOULD be a set-up for a great book. And a lot of people think it's fantastic (I recently saw "Shadow" on a list titled something like "Books You Need to Read Before You Die."). For me? It was a little slow in many parts which could have been fixed with editing. At almost 500 pages, it was WAY too long. And I'm not afraid of a long book. I read "Gone with the Wind" in a weekend, and I can burn my way though a Harry Potter book in no time. But reading "Shadow" was like pulling teeth for me. Which was annoying because I love the premise of the book and it was very well written. It just needed to be about 100 pages shorter.